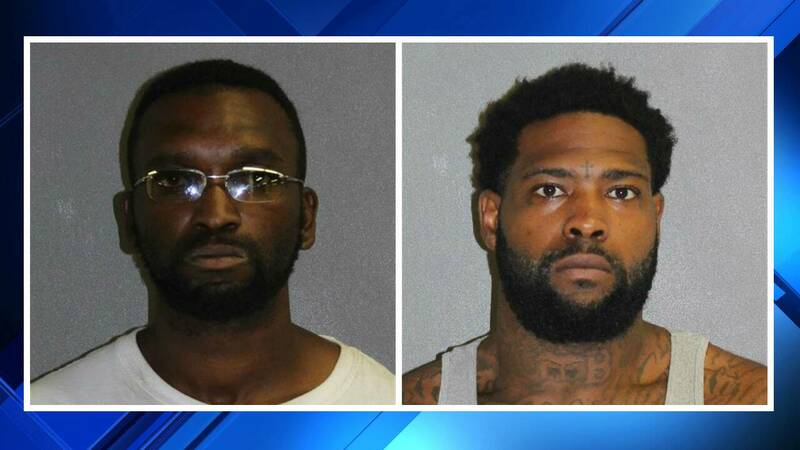 VOLUSIA COUNTY, Fla. - Two Daytona Beach men face charges stemming from two armed robbery investigations in Volusia County, officials said Thursday. Following the robbery incidents, deputies with the Volusia County Sheriff’s Office spotted a car Wednesday evening that they believed the men were inside -- and they caught up with the suspects, who have since been identified as Antonio Harris, 33, and Alexis Neal, 27. Harris and Neal were arrested. As of Thursday morning, they were being held without the option to post bond at the Volusia County Branch Jail. Among the charges they face is a count of robbery with a firearm, deputies said in a news release. Just after 4 p.m. Wednesday, deputies learned of the first robbery in the Daytona Beach area. A man said he was working on a house in the 1200 block of Granada Avenue when a burgundy Nissan Altima pulled up and a passenger got out of the car. That passenger pointed a gun at him and demanded his wallet, money and cellphone, the victim told deputies. The man said that the person responsible had a distinct tattoo of a cross between his eyes. While deputies were searching for the Nissan Altima, a second call came in about another armed robbery involving the same vehicle description, authorities said. The second incident took place just after 6 p.m. in the 400 block of Main Street, in the city of Lake Helen, according to the statement from the Sheriff’s Office. It was soon after this robbery that a deputy spotted the Nissan Altima heading north, going about 88 mph -- in a 55 mph zone, officials said -- on Prevatt Avenue. A deputy at State Road 44 and Prevatt Avenue used stop sticks to try to slow or halt the Altima, but the driver avoided the sticks and took off heading east on State Road 44, officials said. Then another deputy on SR 44 deployed another stop stick and got a hit on one tire. The tire disintegrated, but the driver of the Altima kept on going, despite being on three tires and a rim, deputies said. At one point, one of the men threw a bag of heroin from the car, and witnesses told authorities that the driver tossed a handgun out the window. A mask was discovered in the road as well, deputies said. Harris and Neal stopped and ran from the car at the Malibu Condominiums at 1701 S. Atlantic Ave., but they were caught a short time later, the release said. The tossed handgun had been stolen out of Holly Hill, deputies determined. Harris has been charged with aggravated fleeing and attempting to elude law enforcement, possession of cannabis with intent to sell, possession of heroin, possession of schedule IV narcotics, grand theft firearm, possession of a firearm by a convicted felon and use of a firearm in the commission of a felony. Neal (who has a tattoo of a cross between his eyes as described by the first victim), is charged with possession of heroin, grand theft firearm, possession of a firearm by a convicted felon and use of a firearm in the commission of a felony, deputies said. Additionally, the Lake Helen Police Department charged both men with robbery with a firearm. More counts are pending. Harris and Neal are felons who were recently released from prison. Harris was convicted of robbery with a firearm, and Neal was convicted of carjacking with a firearm, deputies said.